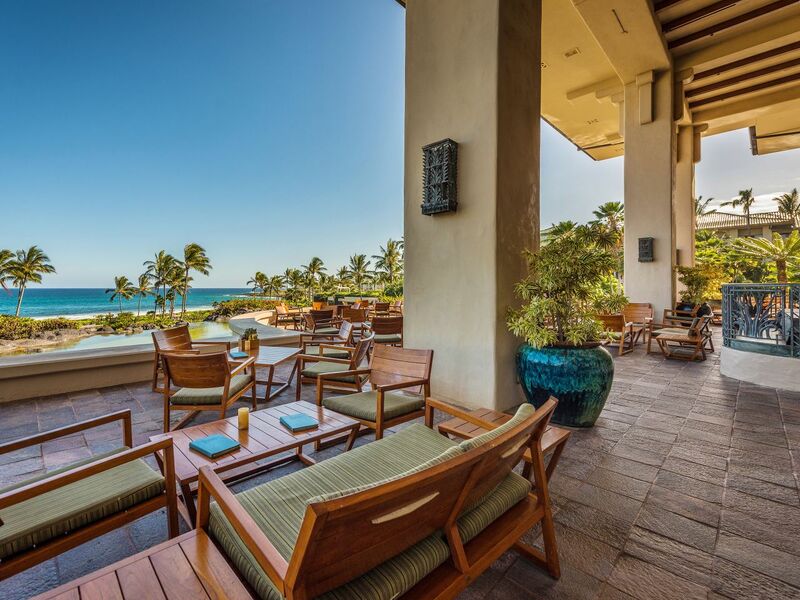 Sweeping ocean views welcome you to the restaurants and bars at Grand Hyatt Kauai Resort. For dinner choose from a romantic open-air steak and seafood restaurant set over a lagoon, classic Italian with patio dining or delicious sushi. 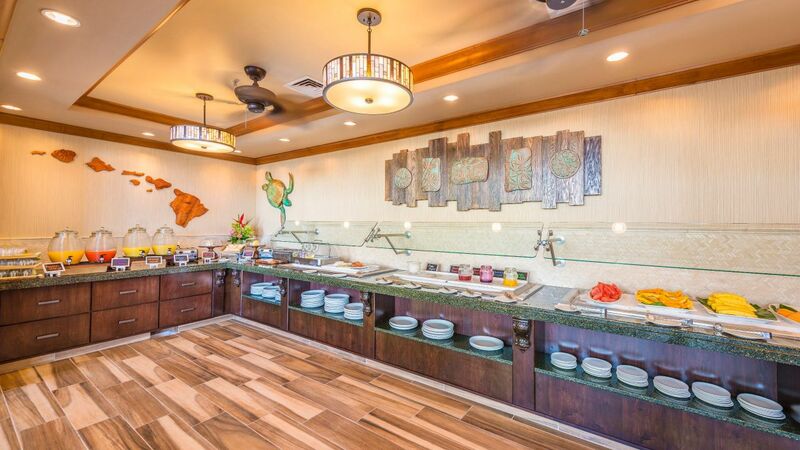 Start the day with a breakfast buffet or coffee bar, lunch with a view or indulge in a Hawaiian luau with a bountiful buffet. 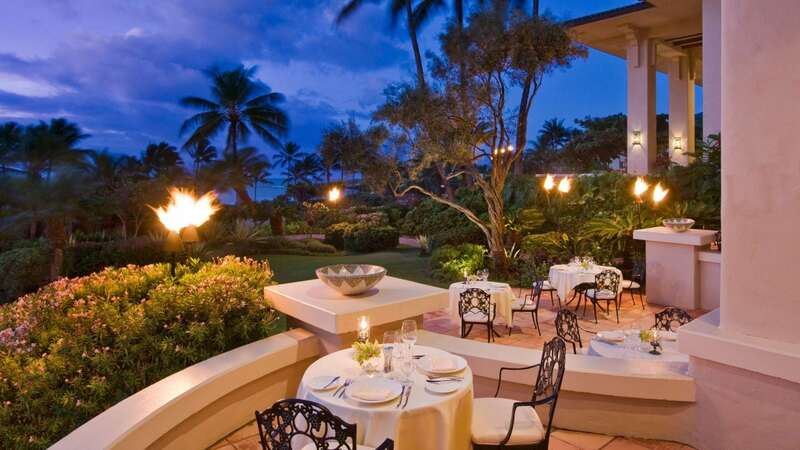 For a private dining experience, the resort offers a starlit beachside dinner for two as well as in-room dining. 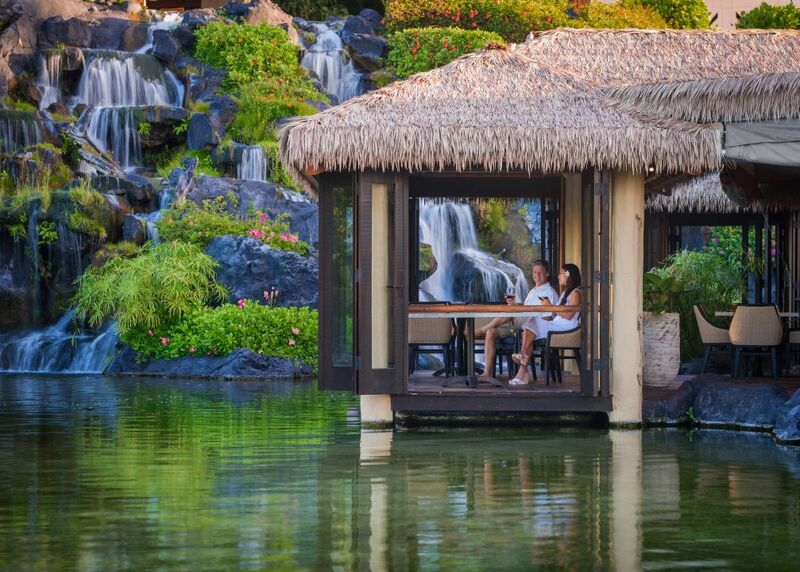 Feel the romance of Kauai in thatched-roof bungalows floating above a koi-filled lagoon at the base of a waterfall. Our contemporary Hawaiian cuisine is inspired by local ingredients and the rich culinary traditions of Hawaii. 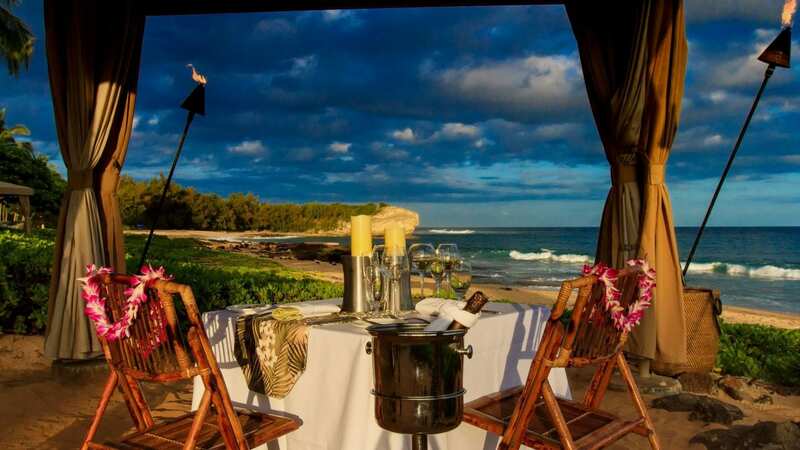 Tidepools will dazzle with the freshest of fish and steak prepared with island flair in Kauai's most unique setting. Lounge: 5:00 p.m. - 10:00 p.m. Enjoy an evening of elegant ambiance, Old World favorites and exceptional service at Dondero's. Beautiful frescoed walls reminiscent of a vintage Tuscan villa set the tone. Floor to ceiling windows overlooking the resort and ocean set the view. Old World favorites made using the freshest of ingredients set the menu. 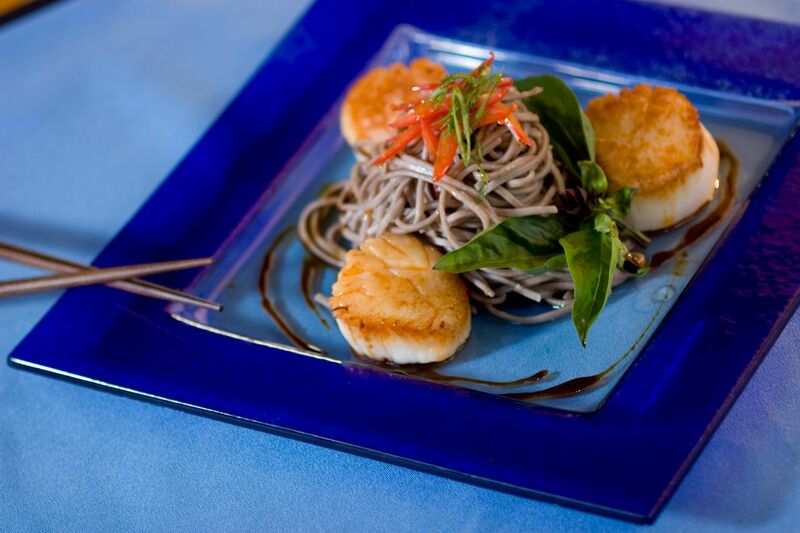 Join us for casual yet upscale dining and relish traditional flavors artfully prepared. Tuesday through Saturday: 5:30 p.m. - 9:30 p.m. 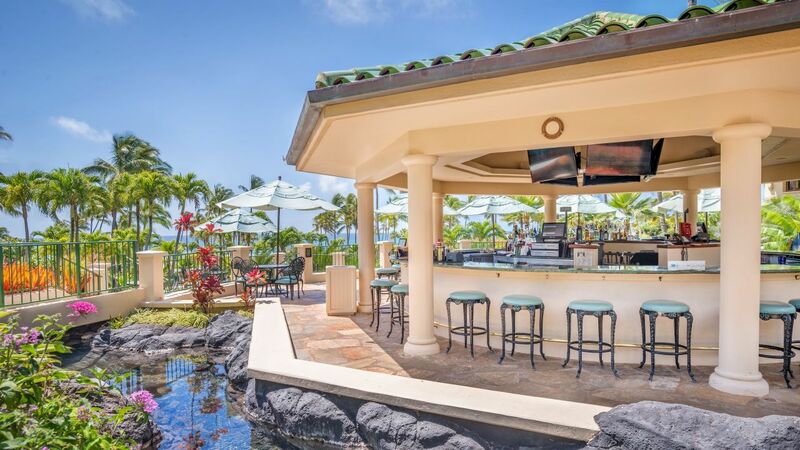 This luxury nightspot offers a truly unique and welcoming atmosphere with a 27-ft koa wood bar, outdoor lanai and intimate lounge seating. 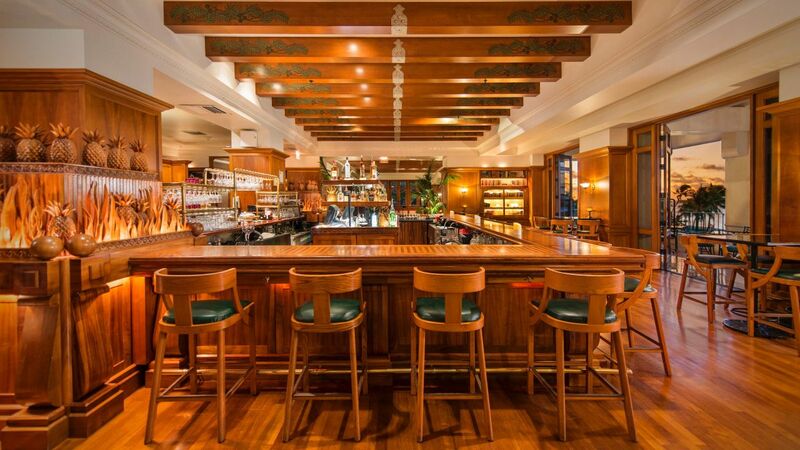 The bar features beautifully carved koa in traditional sugarcane and pineapple motifs. Sushi: 5:30 p.m. - 9:30 p.m.
Minors are permitted: 5:30 p.m. - 9:00 p.m.
As day turns to evening, bring the family to Seaview for a stunning sunset and live entertainment. Dine on a local twist of an all American menu with cocktails and appetizers, salads, pizzas and burgers. "For Kids, By Kids" keiki menu nightly. Live Hawaiian entertainment including hula 5-7 p.m. with Island entertainers 7:30-9:30 p.m.
Espresso Bar & Breakfast: 5:30 a.m. - 11:00 a.m.
Cocktails & Soft Drinks 11:00 a.m. - 5:00 p.m.
Dinner & Keiki Menu: 5:00 p.m. - 9:30 p.m., to-go available until 10:30 p.m.
Hawaiian Entertainment: 5:00 p.m. - 7:00 p.m.
Island Entertainment: 7:30 p.m. - 9:30 p.m. Spectacular ocean and garden views welcome you to join us for breakfast and lunch daily. This open-air casual restaurant is the ideal spot to plan another perfect day in paradise. Join us each morning for our renowned breakfast buffet, offering a sumptuous array or order a la carte specials. Come for lunch and enjoy tempting salads, sandwiches and specialty entrees. Conveniently located poolside, stop in for satisfying burgers, wraps, salads and more. Our vintage surf shack restaurant offers a satisfying menu with everything from fish tacos to fresh salads, panini to smoothies and assorted lite bites. Shave Ice too! 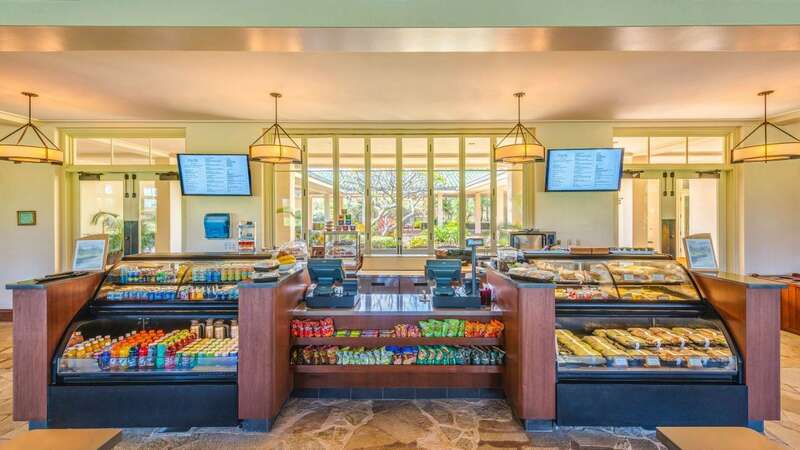 Poolside Service: 11:00 a.m. - 5:00 p.m.
Stop by for a delicious breakfast or lunch to take with you to the beach, hiking to Mahaulepu or golfing at Poipu Bay. From yogurt & fruit with a cappuccino to a panini with a beer, you'll find delicious to-go options here. Grab and Go Available: 6:45 a.m. - 5:00 p.m.
Like captains of old, you sit perched above it all, overlooking all the pools. 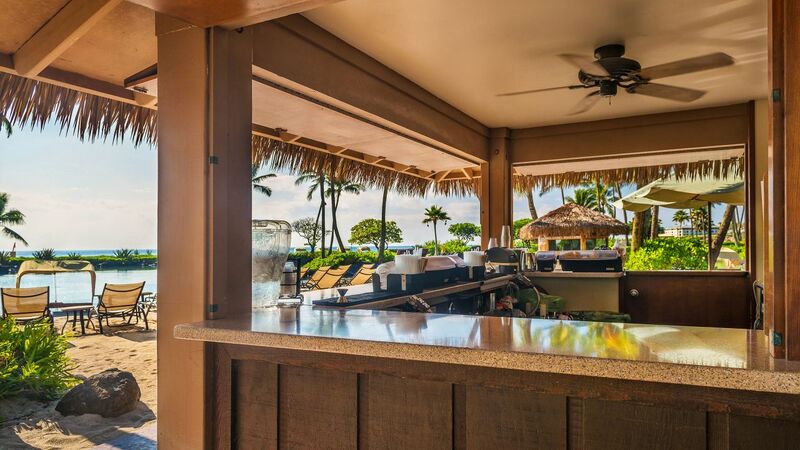 From late morning to sunset this lively spot serves up fantastic views and tropical drinks to keep you cool in the warm Kauai sunshine. 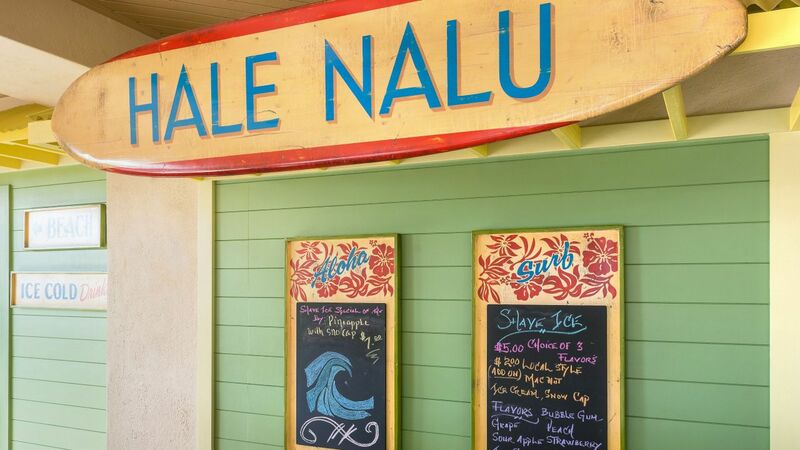 Lunch items from Hale Nalu are available. Rocket down the waterslide, then head on over to Shipwreck Bar for a refreshing drink to keep you going during your day in the sun. Join us for a fantastic journey through the rich cultural history of the Hawaiian people. Discover the stories of Hawaii's land and people through ancestral dances. 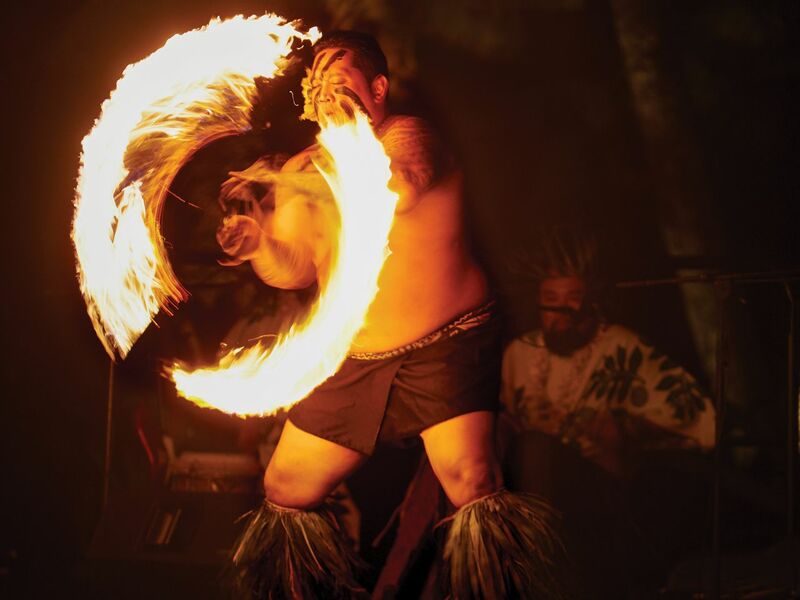 From the tantalizing aromas of the elaborate feast to the intricate dance steps of the hula, you will be entertained and amazed. Sunday and Wednesday, 5:30 p.m. – 8:30 p.m. 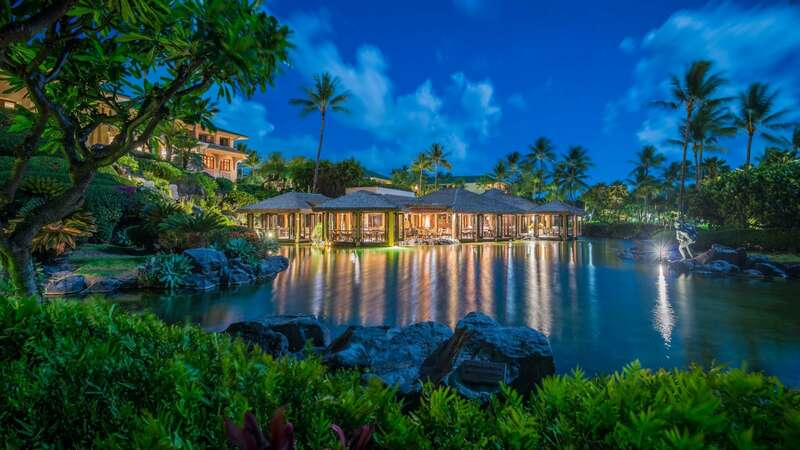 Welcome to Grand Hyatt Kauai Resort & Spa Make a stay at Grand Hyatt Kauai Resort & Spa extra special for yourself, friends and family by having a delectable treat delivered to the room. Please look through all of our amenity offerings to pick just the right treat. To ensure proper delivery, orders must be made 48 hours in advance of guest arrival. If you are ordering amenities for multiple days, a separate order must be submitted for each day. Prices and items may change and are subject to availability. Order a special treat to be delivered to a guest here.